At CAInstruments we have many years of experience in the automotive industry which allows us to offer more knowledgable service and assistant then our competition. We are always willing to take the time to ensure that you are completely satisfied with our products. You, our customer, are our highest priority - that is our Guarantee. CAInstruments is very proud to offer you all our in-house manufactured products, such as our Ultra-Link Diagnostic Tool and our most recently added product, the Sky Drive GPS Speedometer Sensor. We always take the care and time needed to develop for you outstanding products that will help with your businesses or just day to day needs. There is always a dedicated employee ready to help you find what you are looking for or to answer any questions you may have. Our pick and place machine and screen printer assist our employees in manufacturing our products with precise accuracy.Every board is individually inspected to make sure everything is in order. It is then tested and configured using our state of the art software that is developed by our team of engineers. Alot of our development ideas come from our racing background. Tim Stevenson, the owner of Tachman/CAInstruments, has been a part of the racing community for many years. The important knowledge that he gains by working closely with vehicles of all shapes and sizes allows CAI to develop products such as our Sky Drive Speedometer Sensor. 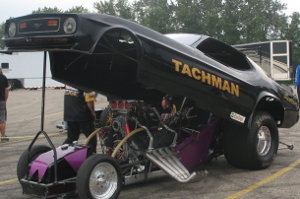 To see more on Tachman racing at Castrol Raceway visit YouTube to see some of our racing videos. Canadian Automotive Instruments strives everyday to help bring you the best products. We will continue to grow in the automotive industry to develop new technologically advanced products for you, our customer. Canadian Automotive Instruments are warranted to be free from defects in materials and/or workmanship under normal use and service for two years. CAInstrument's obligation under this warranty is limited to repair or replacement at our option, at our factory. Customer is responsible for return freight shipping costs. Returned Goods Authorization number (RGA#) is required prior to a return. All electrical parts are non-returnable. **Note: All products that are not manufatured by CAInstruments are limited to the manufactures warranty terms and conditions.